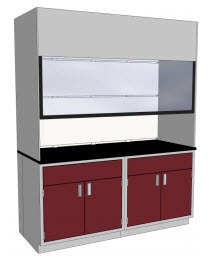 The LOC Thin Wall Fume hood provides an excellent low cost means of exhausting high heat loads and nonhazardous fumes. The thin wall design allows for maximum interior work area and is well suited for installation on any counter of 30” depth. The static pressures listed above are for the hoods only. An appropriate amount will have to be added to this figure to compensate for the pressure drop through the duct system.